Sun Ra was one of the twentieth century’s most daring originals, a free jazz pioneer and afrofuturist whose cosmic philosophy, radical production methods, and wild commitment to his own musical vision made him a benchmark of artistic integrity. Ra emerged as a prodigious jazz piano student in the 1930s, but by the time he and his band, the Arkestra, were coming to public attention in the late 1950s, he was beginning to forge a challenging approach all of his own. Sun Ra and the Arkestra made music which sprung from the jazz tradition, but was free of many of its harmonic, melodic, and structural conventions. By the ‘early ‘60s, with the Arkestra taking up their first significant slot at New York’s prestigious Slug Club, Ra’s dissonant, chaotic output bore resemblance to the work of pioneering composers like Karlheinz Stockhausen as much as the be-bop jazz dominating the club’s programming. Notably, Ra’s piano style encompassed the aggressive, unpredictable rhythms of a figure like Cecil Taylor with the luxurious sweeps he attributed to the influence of Chopin. Nonetheless, Dizzie Gillespie and Thelonious Monk, who were leading lights of the contemporary jazz scene, gave Sun Ra the vital support which helped convince him to continue, despite his challenging work often prompting mixed reactions from the Slug’s audience. 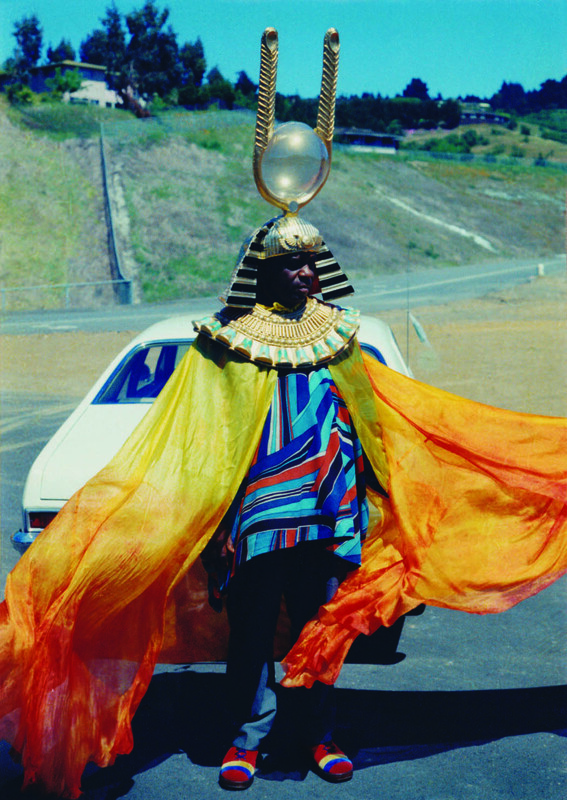 Sun Ra’s output was intimately linked with his eccentric philosophical outlook, whose futuristic alien visions permeated not only his musical stance, but also the Arkestra’s rehearsal practices and spectacular stage presence. The composer believed that he had had an extra-terrestrial visit in 1936, which had revealed to Ra his birth on the planet Saturn. It was this revelation which gave Sun Ra’s El Saturn records, which saw the release of over 100 handmade albums in the artist’s lifetime, its name. Sun Ra’s cosmic philosophy permeated the artist’s total commitment to his work, with the Arkestra’s tireless daily rehearsals in their Philadelphia commune meshing spiritual fervour with musical ambition in what Ra called a “joyful noise”. On stage, Sun Ra directed the group’s wild improvisations clad in glittering, cosmic clothing, and required the hundreds of musicians who have played in the Arkestra since its inception to do the same. The 1974 track “Space Is The Place” is a mantra-like embodiment of Sun Ra’s modern, yet spiritual music. The formidable example laid out by Sun Ra & the Arkestra continues to be a reference point for a huge range of contemporary musicians. In his lifetime, Sun Ra’s commitment to electronic keyboards,including one of the first minimoog synthesisers was prophetic, it is subsequently no surprise that electronic musicians from Flying Lotus, to Mike Huckaby, and Caribou have explicitly cited Ra as a major influence. Sun Ra’s inspirations naturally extend to the avant-garde, and even rock music, with the composer supporting Sonic Youth shortly before his death in 1993. The Arkestra continues to this day, with key members like Craig Haynes and Marshall Allen continuing to spread the composer’s incomparable work internationally. The Sun Ra Arkestra drummer discusses rhythmic energy, almost working with James Brown, and Sun Ra's mastery of...well, nearly everything. The Sun Ra Arkestra director discusses the teachings and creative punishments of former bandleader Sun Ra, one the most singular figures in modern jazz.